Well, this makes us wish we were kids again. Some little sluggers were born to play baseball, but it takes all kinds to build a Little League team. Luckily, the folks at Wilson Sporting Goods have just delivered in a big way for all those players who don’t fit the standard mold: This week, they released a line of baseball gloves with extra strings to pick at for kids who would rather be drawing at home! Literally all the yes! This just made some kid’s whole freaking life. 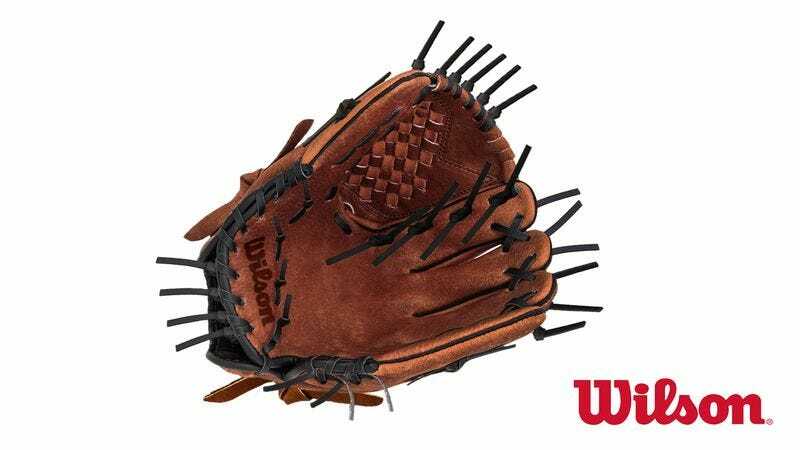 Wilson’s new A525 “Daydreamer” series gloves feature nearly twice as many little strings as conventional baseball gloves, giving young players no end of options to fidget with as they shuffle anxiously in the outfield, wishing they were inside with some nice, sharp colored pencils. For any kid counting down the hours until they can get home and trace Venom out of their How To Draw Comics The Marvel Way book, this mitt and its pre-loosened laces are a total godsend, offering endless picking potential through inning after interminable inning. No matter whether you’re a string picker, a string chewer, or the kind of kid who just sits down, takes the glove off, and thinks about whether to draw a guy with two swords or one big sword that breaks apart into two separate swords, Wilson’s got you covered. Of course, this glove is no slouch when it comes to fielding. The glove comes complete with a ParaShock palm pad to absorb impact from pop flies you’ve spent the whole game fearing, and is made of durable pigskin leather that somehow still won’t be broken in by the end of the season. Wilson even designed the glove specifically for long, slender fingers and easily bent wrists, making it an ideal fit for left fielders who are really only keeping at this because their dad buys them a meatball sub and salt-and-vinegar chips after the game, and who know full well that they could be using the time to draw a new type of wyvern that does electric blasts. Consider us super jealous, because it sounds like playing Little League just got a whole lot more awesome!